NEW YORK (CNNMoney) -- "IBM is not just about playing games." That's what IBM's Vice President of Research Katherine Frase said when asked what the company has planned for Watson after its Jeopardy match this week. "Now that we've taught Watson to play Jeopardy, we're exploring the best ways to use this kind of capability to solve real problems," she said. "We're looking into what more we need to do to make it work for businesses." 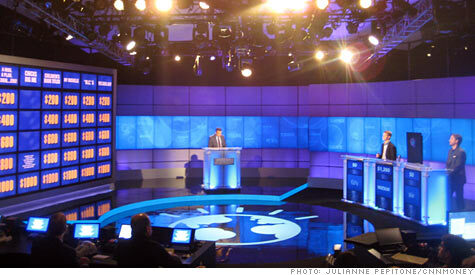 IBM has spent years developing Watson, the computer that has mastered questions, puns and a wide array of esoteric trivia in order to take on Jeopardy grand champions Ken Jennings and Brad Rutter. The high-profile bout will begin Monday night and continue through Tuesday and Wednesday. But starting Thursday, IBM will have to figure out how to advance the technologies that emerged from the three years of research and dozens of engineers the company dedicated to the project. Watson didn't come cheap. IBM (IBM, Fortune 500) won't disclose how much it has invested in the project, but Eric Nyberg, a Carnegie Mellon computer science professor who has worked on Watson, estimates that the project cost IBM up to $100 million. Richard Doherty, research director for the Envisioneering Group, which does consulting for IBM, puts his estimates significantly higher. He thinks that Watson cost IBM roughly 5% to 10% of the company's $6 billion research and development budget each year. That would put Watson's three-year price tag at roughly $1 billion to $2 billion. Either way, IBM has begun to develop theoretical applications for Watson that could eventually lead to real-life business products. "Watson, M.D." is a concept that IBM researchers developed that would use the question-and-answer system as a diagnostic assistant in physicians' offices. A doctor could ask a Watson terminal questions, and the system could use both online resources as well as similar patients' medical records to help reach a diagnosis. Watson, M.D. could also be used to help find information about rare conditions that no one has ever come to that particular hospital for. Professor Nyberg said he was aware of the Watson, M.D. concept but wasn't sure if IBM had yet developed a working prototype. IBM's Frase said she believes Watson could also be used as a question-and-answer engine for call centers, or an analytics tool for financial companies. IBM has begun preliminary discussions with some businesses about Watson, but it is still in the exploratory phases of any potential projects, she said. IBM isn't ready to disclose which companies it is talking to. But some analysts who follow IBM are convinced that the company will find business partners fairly quickly -- especially after they see what Watson is capable of on national TV. "IBM has been extremely efficient at monetizing its investments in the past," said Charles King, principal analyst at Pund-IT. "I would at least expect to see bits and pieces of Watson be incorporated into a variety of products over the next few years." Of course, this isn't the first time that IBM has bet big on something that it didn't have a clear business plan for. Deep Blue, the supercomputer program that bested chess master Gary Kasparov in 1997, was a demonstration of what was possible. "We knew it wasn't just about chess, but we didn't know what was going to happen next," Frase said. What happened next? A unexpected, dramatic breakthrough in computer architecture. Before Deep Blue, most computers were structured with one microprocessor serving as the brain of the device. But the Deep Blue team found that the demands they were putting on the computer made it extremely hot. To solve the problem, the team built a computing structure that had multiple parallel processors instead of one big CPU. "That changed everything people knew about computer architecture," Frase said. "The outcome was that future computers were built with much lower power demands and higher computing power." Frase believes the Jeopardy computer will have a similar real-world impact. Because it's not just about playing games.